Aerial Yoga Hammock 5.5 yards Premium Aerial Silk Fabric Yoga Swing for Antigravity Yoga Inversion Include Daisy Chain , Carabiner and Pose Guide. There are many Aerial Yoga Hammocks on the market, but our Basic Aerial Yoga Hammock is made from Certified Quality Material And Hardware. 1 x 5.5 yards Elastic aerial hammock , 2 x Steel Screw-lock Carabiners (25KN), 2 x 10ft Nylon Reinforced Daisy Chains (23KN). Max rated for 2,000 pound dynamic load. The Daisy Chains and carabiners are certified to climbing standards. 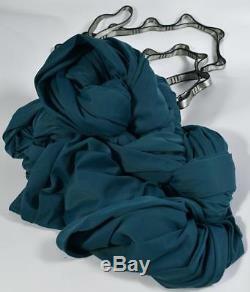 40-Denier Nylon Tricot is a two-way stretch, so the fabric has a low to no stretch. When it is banded together like a swing, and when you cocoon inside the hammock the fabric gives just enough so that it feels comfortable for the body and skin. It Can be Fully Cocooned Or Laying Fully In. It is a stretchy fabric. Not like the parachute type of material used often on other yoga style swings. 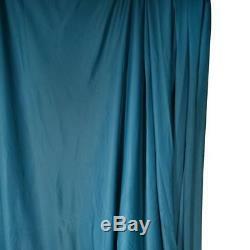 This premium fabric is used for Yoga Slings and Aerial Silks. It is long lasting and comfortable. The double point is great for relaxation, stretching, stress reduction, and back pain. This double point Yoga hammock is easy to get in and out of, easy to clean, super comfortable, and easy to adjust the height. Order it now, this is the best yoga hammock on the market. What Kind Of Fabric Is The Hammock? The Aerial Yoga hammock is made of 5 meters of 40-denier Nylon Tricot fabric, which is the same type of fabric used in Cirque du Soleil performances. 40-Denier Nylon Tricot is a two-way stretch, so the fabric has a low to no it is banded together like a swing, and when you cocoon inside the hammock the fabric gives just enough so that it feels comfortable for the body and skin. Does This Come Pre Knotted On The Carbine? No, it does not become pre-knotted. 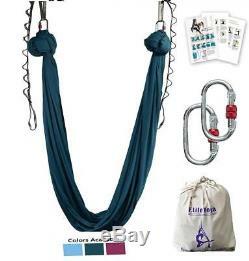 Our aerial yoga hammock kit include Knot tying guide - step-by-step instructions on making set-up safe and easy to follow. Can Be Fully Cocooned Or Laying Fully In It? Yes, the fabric does have give, it is a stretchy fabric. 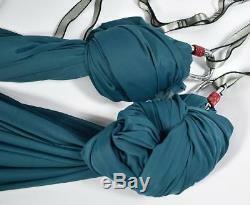 It is not like the parachute type of material used often on other yoga style swings. Can The Daisy Loops Wrap Around An Expose Beam To Hang The Swing Without Drilling Into The Beam? The daisy chains are very strong and are able to be used like that. We often recommend that you use the unlooped end of the daisy chain and place it through another loop after it is wrapped around the beam or pole. As you lay on the swing it will cause tension on the loop formed around the beam/pole and hold you in place. How Wide Should I To Hang The Swing From? Shoulder distance is probably the safest and most supportive. This Kit Works Perfect For. 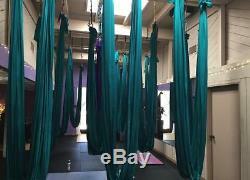 Aerial Yoga, yoga swing , yoga sling , aerial dance, aerial fitness , air yoga , aerial hammock , Anti-Gravity Yoga, Unnata Yoga, Suspension Yoga, Gravity Yoga, Antigravity Yoga, Flying Yoga, Aerial Pilates Pilates hammock. 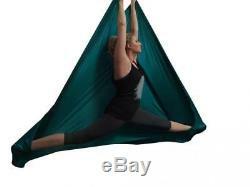 The item "Aerial Yoga Hammock 5.5 yards Premium Silk Fabric Swing for Antigravity" is in sale since Wednesday, April 18, 2018. This item is in the category "Sporting Goods\Fitness, Running & Yoga\Yoga & Pilates\Yoga Props". The seller is "sale_pros" and is located in US. This item can be shipped to United States, Canada, United Kingdom, Denmark, Romania, Slovakia, Bulgaria, Czech republic, Finland, Hungary, Latvia, Lithuania, Malta, Estonia, Australia, Greece, Portugal, Cyprus, Slovenia, Japan, China, Sweden, South Korea, Indonesia, Taiwan, South africa, Thailand, Belgium, France, Hong Kong, Ireland, Netherlands, Poland, Spain, Italy, Germany, Austria, Israel, Mexico, New Zealand, Philippines, Singapore, Switzerland, Norway, Saudi arabia, Ukraine, United arab emirates, Qatar, Kuwait, Bahrain, Croatia, Malaysia, Brazil, Chile, Colombia, Costa rica, Dominican republic, Panama, Trinidad and tobago, Guatemala, El salvador, Honduras, Jamaica.